Back in 2008 I felt I had done a pretty good job at photographing London’s May Queens – I had enough material for a book and I’d been promised a show at a major museum. But the funding for the show disappeared with the economy and although I’d got some interest in the book it never happened either. In the end I published a book myself on Blurb, in print and as an e-book, which made some of the work available, particularly to some of the people involved – although it had always been available in some quantity on My London Diary. But it wasn’t quite the book I wanted; the photographs were fine, but it lacked the kind of detailed cultural analysis and thorough historical research that I’d hoped the association with the museum might provide. 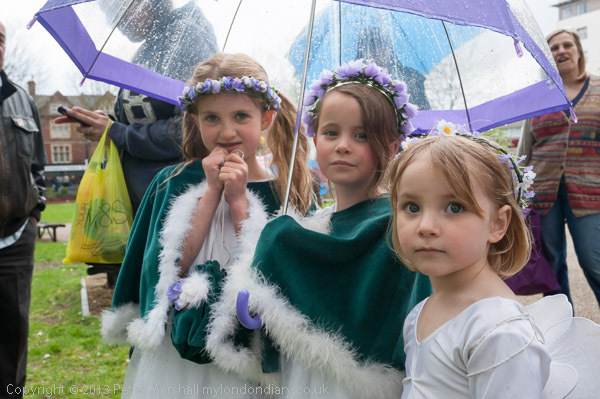 After my disappointment I did return and photograph a few events the following year that I felt I hadn’t perhaps done as much as I could, and in 2010 I went back to the main Merrie England and London May Queen Festival and got some quite different images when pouring rain meant the whole ceremony had to be performed in the village hall rather than its normal outdoor location. The following year I had to be away at the relevant time, and I found that I missed not having been there to take photographs, and I was determined to go back in 2012, as that was the centenary of the event – for which I’d brought out my Blurb book. Although I was pleased to be there for the crowning of London’s 100th May Queen, what was even more gratifying was the welcome I got from many of those taking part – and many of the parents. It was good to see that my work was so positively received. I’d worried when I started taking pictures of the events that my documentary approach would perhaps not be what people expected; quite different in some ways from the way that parents or local photographers or press might approach the participants and the event. No posing and trying to catch fleeting moments that might seem insignificant or possibly intrusive, and I was only too aware of the problems many photographers have had photographing children, particularly young girls. Even so, I still feel a little hesitant arriving as I did at Beckenham as the groups were gathering for the procession to the park. But this time, I was immediately greeted by one of the mothers who recognised me and knew I was the man with the website with all the pictures on. It was a good way to start taking pictures. I’d photographed the event at Beckenham, a week before the main festival, once before and wasn’t sure if I would really get anything new from it. What really did make it different was the weather, and although it would have been better for those taking part to have a warm sunny day, the heavy shower before the procession started did provide some different opportunities. Fortunately too, it stopped just in time for the procession, and more or less held off for long enough for the ceremonies in the park to be completed. There was even an occasional glimpse of the sun, but most of the time it was simply bright but cloudy, making fill flash completely unnecessary. 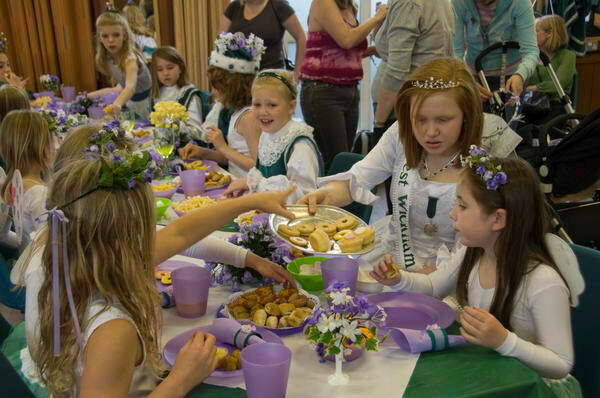 I left as soon as the crownings in the park had finished, while those taking part went on to tuck in to their tea in a local hall – which I’d photographed in 2008. 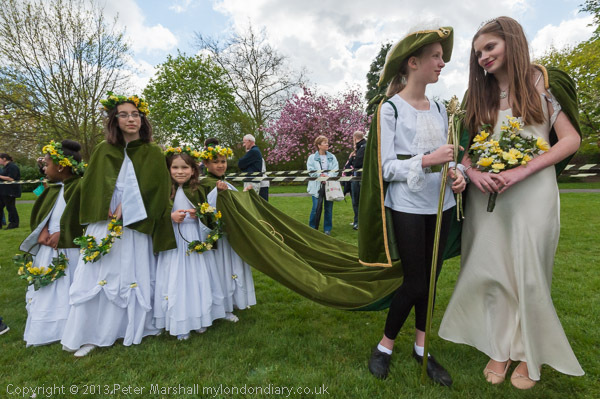 More from this years Beckenham May Queens on My London Diary. I’m still hoping for that more definitive book, and there are now a few more pictures that might go in it. This entry was posted on Tuesday, May 21st, 2013 at 07:35 am and is filed under My Own Work, Photo Issues. You can follow any responses to this entry through the RSS 2.0 feed. You can leave a response, or trackback from your own site.